Can you really make a dent in a troubling space in one day? In just 6 hours? This week, that’s just what a client and I tried to find out. 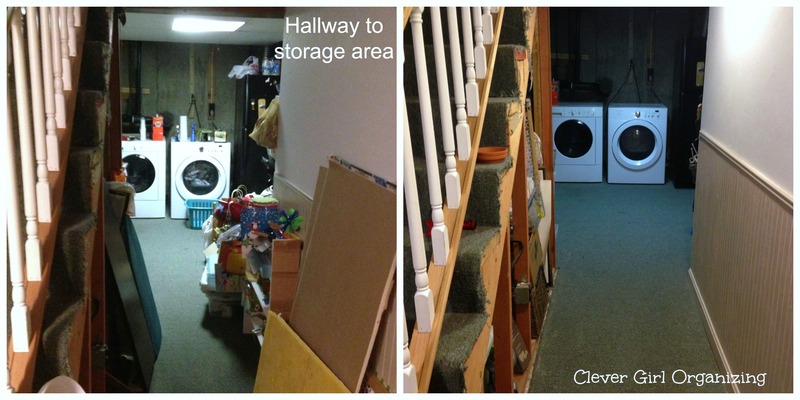 We tackled the only significant storage space she has in her home: a back corner of her finished basement. It’s probably about 8′ x 11′, and includes washer and dryer, a fridge, a cabinet and a few sets of very full storage shelves. It needs to continue to serve a lot of purposes, but needed to be purged significantly and organized, so that my client could really take this space back as a helpful and functioning storage hub for the house. Get it done during the time the two kids were in camp. Before that and after that, they just require a lot more attention, and the blissful “alone to do whatever I want” time ends. Not spend any money on organizing things — bins, baskets, new shelving, etc. This is a basement, and it is basic storage. It didn’t need to have a designer makeover or be magazine cover ready. It needs to be neat, and things need to have places to go. Pretty wasn’t important, and spending money on more containers was even less important. Whenever anyone starts on a project like this, the first huge hurdle is answering the question, “Where do we start?” Everyone struggles with that question, whether or not there’s help around! So, I glanced around to see what I could find that would be a good place to begin. I wanted something that we could finish in under 30 minutes, and would start to make a dent and also feel like we could get a quick win of accomplishments. We started with board games and puzzles (keep vs. donate) and then moved on to books. As we moved these things off the shelves, we really started to empty out some spaces, and have place to shift items around and work in the space. Honestly, going through items went smoothly, and we were able to get to decision points without trouble. My client had a really good handle on what was down in this space (not too many surprises!) and had good spots in mind for who might benefit from receiving some things she no longer had use for, or where things might be able to be donated. 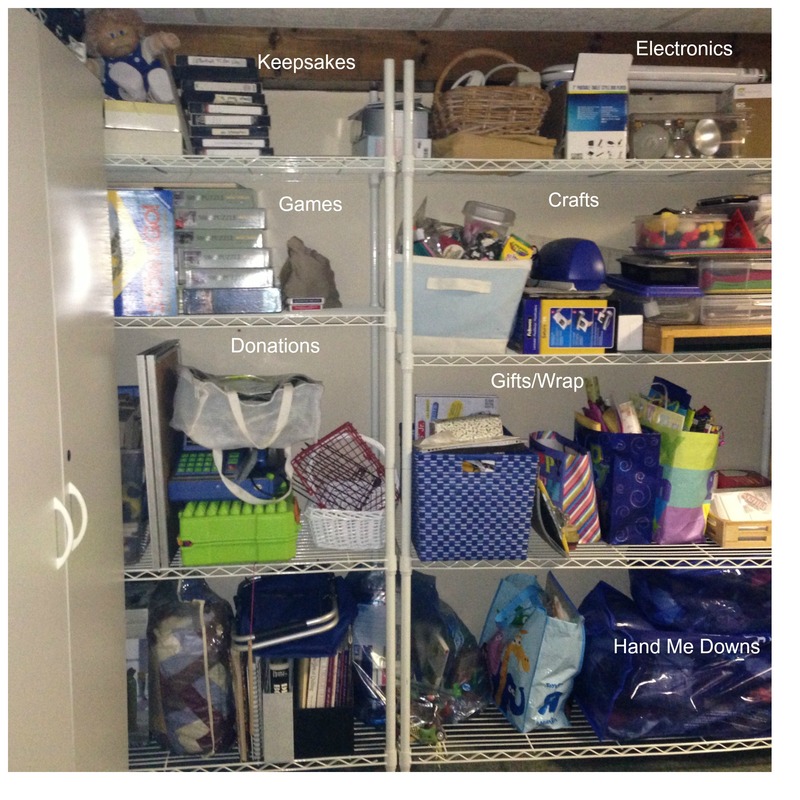 We were able to make use of her garage to move donations and give-aways out of the space (so key to a great organizing project is having a place to place items that won’t remain in the space!). There were some fun and sentimental items to go through, and that helped make this project a little more enjoyable. Need to make the best out of being in a basement for six hours, right? 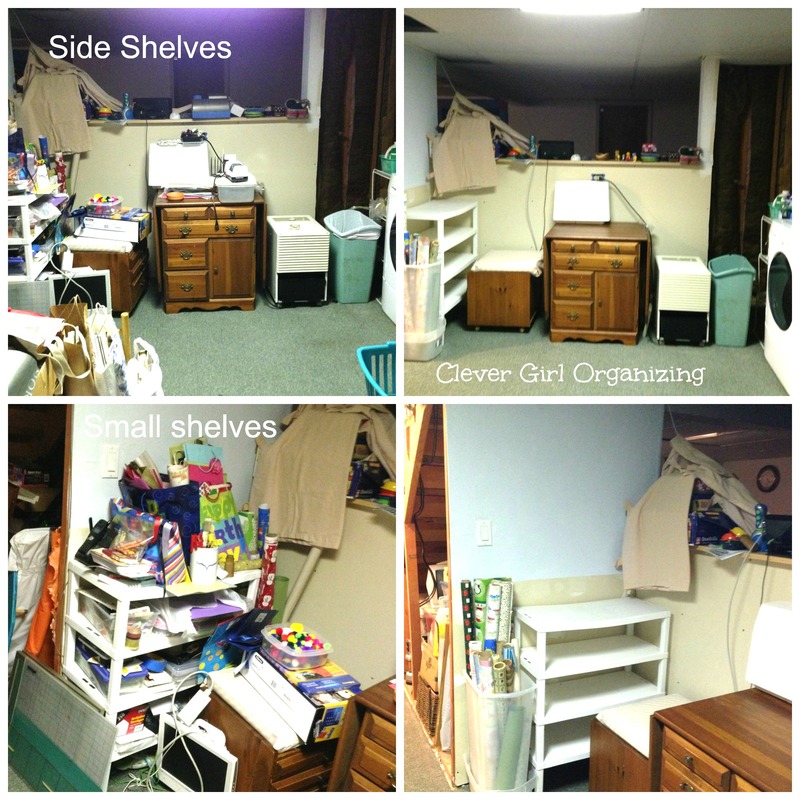 Some great before and afters really show off what six hours in a basement and some elbow grease can do to help reclaim such a vital space for storage in a home! Our goal of not spending any money worked out well! We were able to reuse the bins and baskets that already existed in the space, and the cardboard boxes were redeployed to hold donations and give-aways, which will move onto their final destination this week. An entire set of small shelves were completely empty, and the client is debating how best to repurpose them. The emptied wooden sewing cabinet and ottoman chair will move on to another room, and that whole side space that used to hold crafts and gift wrap will soon be wide open. The client looks forward to keeping this space empty for much-needed room for a drying rack for laundry, and just have some emptiness around! I was so excited for this client’s finished product! You could just tell how happy she was to reclaim this space, to have a new system for where to put things that come into the space, and where to find the things that are already there. She’s told me more she keeps going down to the space, because she can’t believe how great it looks! Nothing like checking out a one-day project like this one to make you want to tackle your own space, right?